Both teams posed for an after game photo. Navy takes the ball as they advance down the field. Navy drew first blood scoring on a running play. The Warriors seemed to enjoy the competition. 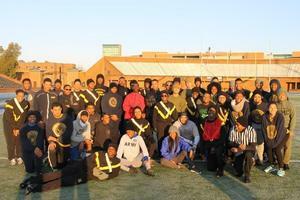 The game ended with a two touchdowns to one victory for the Army, with no injuries.